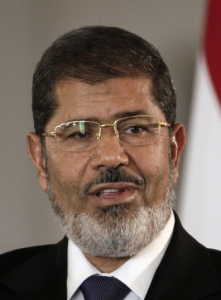 CAIRO | Tue May 7, 2013 11:37am EDT (Reuters) – Egyptian President Mohamed Mursi increased the influence of his Muslim Brotherhood over government in a cabinet reshuffle that replaced two ministers involved in crucial talks with the IMF over a $4.8 billion loan. The changes fell well short of the opposition’s demand for a complete overhaul of Prime Minister Hisham Kandil’s administration and the installation of a neutral cabinet to oversee parliamentary elections later this year. It looked unlikely to help build the political consensus the International Monetary Fund is seeking for reforms needed to secure a loan seen as vital to easing Egypt’s deep economic crisis – an unaffordable budget deficit and a plunge in the value of its currency. The government is struggling to seal a deal that would require it to implement austerity measures. Kandil, a technocrat appointed premier last year, named nine new ministers. They included Amr Darrag, a senior official in the Brotherhood’s Freedom and Justice Party, as planning minister. The outgoing minister, Ashraf al-Arabi, had played a central role in the IMF talks. Another Brotherhood member, Yehya Hamed, was named investment minister, and Ahmed el-Gezawi, an FJP member, took over agriculture, lifting the movement’s share to around a third of the cabinet’s 35 portfolios. President Mohammed Morsi also obtained a PHD in engineering in the US where he taught as an assistant professor at California State University Northridge in the early 1980s.